Now in this example, we obviously won’t be need to convert our output voltage back to a voltage, but will instead transmit our modulated signal as it is. If you have an oscilloscope, you can attach it to the output, and a potentiometer to the input and watch your PWM signal change with the input value. There are many applications for PWM modulation, the most commonly being control of servos – either directly by wire or by radio-control. The Arduino has a nice library that handles creating the correct PWM signal for servos. For more information, see the <a href="http://www.arduino.cc/en/Reference/Servo" onclick="__gaTracker('send', 'event', 'outbound-article', 'http://www.arduino synthroid cost.cc/en/Reference/Servo’, ‘Arduino Servo Library’);”>Arduino Servo Library. On the Arduino website, there is a nice tutorial on setting timer frequencies and their ramifications. You are now armed with the knowledge you need for creating and using your own digital to analog circuit. Such circuits are incredibly useful. My favorite is driving MOSFETs and op-amps. By sampling a current or voltage somewhere, you can then determine what voltage you need to output to create the level of current or voltage you need. By means of such a simple system, you can make your own voltage regulators, current regulators, LED drivers, etc. The possibilities are endless. If you have any questions about this article, please drop me a note in the comments. If you have any improvements, corrections or additions, please let me hear about them as well. Arduino’s AnalogWrite – Converting PWM to a Voltage by Provide Your Own is licensed under a Creative Commons Attribution-ShareAlike 4.0 International License. This entry was posted in Tech and tagged analogWrite, arduino, digital to analog converter, pic. Section: Article. Bookmark the permalink. Both comments and trackbacks are currently closed. Simple, clear, concise…an excellent tutorial. Thank you. A great Article very usefull indeed. Scott, where do you get the little D-A Conv PCBs? Hi, I´d like to know if I could use this circuit to convert a frequency to voltage signal from a ignition cable of my car ( by capacitive coupling), for a reliable RPM measuring. thanks. I think you can buy frequency-to-digital converters that would probably work better for a tach. Im also fairly sure that I have seen guages that do this automatically and just require a frequency input. The problem with this circuit is that the signal from the coil on your car is not pulse width modulated, the pulses are always the same length so it wont really work. You could pretty easily turn an arduino into a tach using this circuit on the output though. What is the point to this? Most motors handle the PWM just fine. And for applications that need an analog voltage, well…this is only capable of sourcing a small amount of current. That’s a good question. For some applications such as the ones you describe, PWM may be just fine. For others, PWM is not acceptable. In these cases you need a low-ripple voltage. When you buffer this voltage with a high-impedance amplifier such as a FET or an op-amp, you can drive any load you like. This application is intended to drive such high impedance loads only. One example for this type of circuit is driving high intensity LEDs. For these devices, you can’t just apply a full voltage to them without some sort of current regulation, no matter how short the pulse is. They will burn up. You must create some kind of constant current driver. One way is to use the circuit described and apply this voltage to the gate of the FET. By monitoring the current going through the FET, you can set it to whatever value you like by varying the pulse width. Another example would be creating a programmable linear voltage or current regulator, again by using a single FET. You can even create a constant power regulator using this technique. Do these examples make more sense of this article now? if i use accelorometer.. how about the coding? i dont use potentiometer. Great article. Do you mind a question. I am using the arduino to take two input signals to output a 0-5 volt analog control signal. No real load. Respons time is probably the most critical. What cap and resistor do you recommend? Thanks again for a great lesson!!!! That all depends on what timing you need. Go to the RC calculator referred to determine them. Could you use this to convert an audio signal to pwn to control a laser which will send the impluse to a photo diode? Yes, although you probably just want to send the PWM directly to the laser. Usually lasers are pulsed, not attenuated. NO! Lasers are delicate components that can not be driven by PWM. They will – as oposed to LEDs, transistors etc. – suffer from “COD” (Catastrophic Optical Damage) in nanoseconds; that is – long before they die from thermal overheating in for instance a critical junction. I’m looking for a circuit that will interpret a signal that changes in pulse frequency and amplitude to drive a small peristaltic pump to deliver a very small amount of liquid. The pulses come from an lpg injector system, namely Prinns. I have a picture of a scope readout showing an example of the pulse but it doesn’t look like I can post it here. Please could you let me know if this might help me with what I’m looking for? It sounds like you will need to read your input via an analog pin, do you signal processing on it via code, and then output straight PWM. You won’t need the filter specified in this article at all. Pumps like other motors are usually controlled by being turned on and off, not by sending a reduced voltage. Perfect. Knew I had to buffer the pulses and smooth them out in order to measure the current going through the FETs. Have to control the current _smoothly_, not just max value and off using PWM. Thanks for the link to the single pole filter calculator. Scott, do you think I could sum digital audio samples using an Arduino and output this value using PWM and the filter you have suggested. Do you think this would suffice to generate a percussion sound like a bass drum or a snare drum? Please let me know your thoughts or if you have any better suggestions. If you are fast enough :). You must be able to do your signal processing in time to output your value above the Nyquist rate which is usually considered to be 40kHz for high fidelity music. The top frequency for the Timer2 of an ATmega 168 series is 62.5k according to the spec sheet, so as long as you can do your signal processing fast enough to keep up. That would be the trick. Of course you want to make your output filter to be just as fast as well. Lastly you’ll want a high impedance load such as an op-amp or MOSFET in order to make a fast filter. I hope that answer makes sense and isn’t too technical. I would begin by designing a filter you think would be fast enough and try doing some tests – both with an oscilloscope and your ears. — Best wishes on your project. Looking for circuit or suitable instrument which can convert vehicle tach/rpm impulses to analog voltage, i.e. output value of tach/rpm needs to get converted to analog voltage as our hardware takes input from 0 to 5v or even up to 20v. What you need is a frequency to voltage converter. Something like this one or similar. If you are using a micro already, you can also count the pulses and then output a voltage as my article describes. Thanks for the info Scott…..is any ready made Micro board available for PWM to Analog converter? Thanks for the PWM insight. I would wish to use it for triggering mosfets in a variable frequency inverter. Could you shed some more light on the same. you could forward some similar work on the same. Thanks for that great tutorial. Especially for the link to the japanese site. I have 8-bit digital signal coming in from photodiode (the song that is being transmitted from LED and captured by photodiode). Now I want to convert that 8-bit signal back to analog and recover the song. Would your circuit work for it? Or should I just use the PWM signal as an analog input to the mu-encoder? This circuit will work, provided your digital signal is using PWM modulation. Also, make sure response time of the filter is fast enough. For audio, 24K sampling is fine for moderate quality (think cassette tape) audio. For high fidelity, sample at 40K. Also, note for the 8-bit output, your dynamic range will be about 48 decibels. Give it a try and see how you like it (be sure to buffer the filter’s output with an op-amp). I am using the arduino and xbee radios with current transducers to monitor realtime power. The voltage output of the current sensor is wirelessly transmitted as adc value((0-1024) to a xbee receiver which is connected to arduino uno board. This board basically maps the adc value received via xbee(0-1024) into a 0-255 range pwm signal. But this mapping causes loss in resolution, which affects the system, because i am not actually generating a steady voltage equal to the one i read using the current sensor. Do you think a low pass filter circuit will solve this issue by generating accurate voltage from pwm signals coming out of arduino analoque write(). we are making project with the help of arduino kit ATmega8, so we need difference between 8051 micro controller and arduino. Nice article, i would like to drive a model train with PWM [0 to 100%] at about 4V up to 1/3 throttle then linearly run up to 12V. I have an arduino and was wondering how to use PWM and then control the output voltage. For driving motors, you can use PWM directly – you don’t have to filter it to a voltage. Basically, use the PWM output to turn a MOSFET on and off, switching the full voltage. The motor will coast during the off phase, and the result will be a reduction in torque and speed that is correlated to your PWM percentage. Thank you for this excellent tutorial; for me as a Arduino/Electronic beginner really helpful! I would like to drive a tunable lens (http://www.optotune.com/images/products/Optotune%20EL-10-30.pdf) with my Arduino ADK. For this purpose I need DC: 0…300 mA. The manufacturer of the lens proposes some LED Driver Modules. Would the following one (http://www.thorlabs.com/Thorcat/0000/LD1255R-Manual.pdf) work together with the Arduino PWM output? Does that work straight away or do I need the low pass filter your described? Do you know cheaper possibilities (this one is 123 Euros) to do something like that? thanks for the article besides that let me ask you one thing, i don’t understand the use of potentiometer to vary the duty cycle .my point is that by varying the bit sequence in our program with specified delay we can change the duty cycle of our pwm just like any other pin isn’t it? The use of a pot is just an example of how to change the duty cycle. 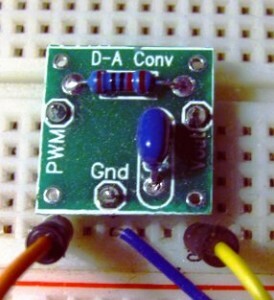 You can change the duty cycle of any PWM capable pin using analogWrite getting the value for that function anywhere. You don’t have to read it from a pot. Since you would need to have a driver of some sort to drive any high power device, I don’t see why you would want to change the voltage into the driver. Just using PWM would suffice. The main exception would be in making your own constant current source using a MOSFET. In that case, you drive the FET with the low pass filter. Thanks for the reply ,am a beginner in electronics ,am using a op-amp h bridge circuit to drive the peltier . Can i give PWM signal from a atmega32 to a driver circuit for peltier element? I am trying to decide if the Arduino is right for me. I am 100% a beginner to this kind of stuff but I have a few things I would like to make that I can not just go out and buy, or so it seems. 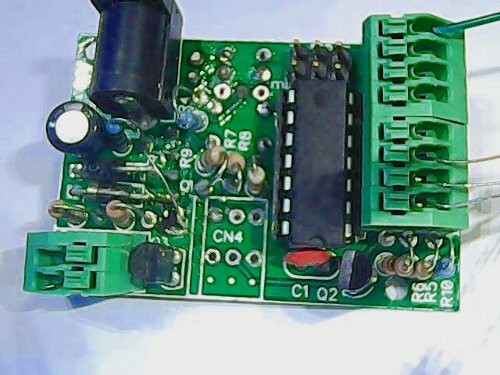 I have a 12v sensor that outputs a frequency. I want to take that frequency and convert it to a linear 0-5v output that will not be driving anything, its just for data accusation. I also have a pwm output that has a constant frequency and I would like to take the duty cycle and convert that to a 0-5v output for the same use. My question is the Arduino the right thing to use? Maybe just a low pass filter and a frequency to voltage converter would be simpler, I’m just not sure if that will fit my needs of getting both signals to be 0-5v. I like your spirit regarding making the stuff you need and want to encourage you in that direction. You can do what you want without an Arduino or microcontroller. It really depends on what your needs are. As far as cost, an ATtiny chip costing $1 will do what you want for less than the freq-volt chip, but you will need to program it. If you actually use an Arduino in a permanent placement, that would of course be fairly expensive. As an alternative you can use the Arduino for prototyping (which is what it is best at), and then switch to just an ATmega328 chip or even program an ATtiny as I said. The only real disadvantage to using a microcontroller is the need to program it. Are you a beginner in electronics or microcontrollers? If you are new to electronics, then microcontrollers can actually be easier for you since they greatly simplify the electronics involved. They kind of convert the messy analog world into the tidy digital realm. If you are new to microcontrollers (and not electronics), then I recommend adding this category to your repertoire. It opens a new world of possibilities. In either case, I recommend getting your application running using the Arduino – it is beginner friendly and makes electronics beginner friendly as well. When you need to deploy your application, you can burn an ATmega or ATtiny chip using your Arduino and pop it into your final project for only a few dollars. Lastly, the other advantage the Arduino offers is intelligence. Your circuit does not need to be ‘dumb’, meaning it can only do simple things like an analog circuit can. You can program in extra features, complex decision making, etc. Smart electronics is the wave of the future. Thank you for the article, I’m sure when I’m farther along in my education, I will understand it better. I am 2 to 3 month novice to electronics and Arduino’s, but I Love challenges, so I may have bitten off more than I can chew with my latest project. I guess it’s silly to go from lighting some RGB LEDs to trying to control a model train with a TV remote, but pardon the pun, that’s how I roll. I actually am doing quite well with it. I have managed to get all manner of speed and direction control with DPDT relays and a Darlington transistor, or two types of motor shield. The problem lies in all cases with the annoying hum generated by PWM. I am currently using Lady Ada’s motor shield and I have set e frequency to 64khz which I am told will make the Pwm in audible, but I still hear it. Do you think your low pass filter could help with this? Can It be placed after the motor shield, before the track? Testing has moved from an n-scale running 12v dc at 300mA to a big G-scale pulling .5-.75A at 16V. If this would help with the hum, could you lead me in some direction as to the values of resistor and Capacitor I might need to make my train function more silently? I have considered going back to the Darlington h-bridge and using a tip120 to provide speed control. Would a low pass filter before the tip120 help with the PWM hum? I am not sure why you are hearing a hum. I suspect it is in the motor itself and not related to the actual PWM frequency. I would suggest trying a different frequency and see if the pitch changes. If you want to control the motor without PWM by filtering, you will need to use N-channel MOSFETs to drive your motor. The low currents you mention should not be a problem with proper heat sinking. You would probably also need to monitor the current or voltage in order to determine what voltage to drive the FET with. The technical aspects of doing so is too much for this comment, but I plan a future article on the subject. You definitely cannot use a low pass filter either before or after Darlington transistors. They are for switching applications only. It is nice to hear about your willingness to tackle such an ambitious project. When facing a big learning curve it can sometimes be quite daunting, but with persistence the pieces eventually fall into place. My best to you. As an 87 years-0ld dinosaur who started life with crystal sets, I have dabbled with electronics ever since, without ever really learning the theory; my most recent venture has been a poor-man’s electrocardiograph (described on the above site). It seems to be time to update this effort, and I see the possibility of using one of the Burr Brown analog amps, and – I hope – a sampler employing an arduino device. I taught myself sufficient of several versions of Basic to be able to draw and print-out the necessary wave-forms, and am now battling with C and its variants. I am told that microcontrollers make electronics easier to grasp, but so far this blissful state eludes me. I am most happy to see your kindly and tolerant responses to us uneducated people, and just wonder if you could point me in the right direction with arduino? ( My field is Medicine, and my aim has been to make it possible for electrocardiography to be available to poor parts of the world). I applaud your efforts with your noble project. The best I can do to help you get started with the Arduino is this article – Getting Started with Arduino. It gives a brief overview and links to some books and other resources. I do recommend the Arduino as the best microcontroller to start with. It has more resources, libraries and tutorials than any other platform. The best way to start is to buy an Arduino and start playing around with the sample “sketches” (programs) and go from there. The Arduino website has libraries for everything you will need to do. You just need to use them and modify the examples as needed. Best wishes and keep up the outstanding effort. I need to replace a defunct HPLC gradient controller with absolute minimal cost (since I’m paying out of my pocket). Basically, I need to generate complementary sawtooth waveforms, one changing from 0 volts to 10 volts over 10-120 minutes while the other changes from 10 to 0 volts over the same time interval. As I (mis? )understand this method, you effectively get about 8 bits of resolution on the conversion. Is that approximately correct? That is correct. On the ATmega328, Timer0 & Timer2 are 8-bit, while Timer1 is 16-bit. Therefore, it is possible to get 16-bit resolution by using Timer1. The Arduino library does not support 16-bit timer values, so you will need to write your own analogWrite equivalent in order to use all 16-bits. Thanks, Scott. I appreciate the advice. I’m thinking that an Arduino Due (with two 12-bit DACs) would be an easier implementation for me. I’ve put my name on the waiting list at Adafruit. Do you trust this method enough to use in lieu of a current limiting resistor for driving LEDs? The Arduino can source up to 40mA of current which is more than sufficient to burn out even most high mcd value LEDs; I am considering using this method to exactly deliver the maximum forward voltage to an LED based on its specifications. Good idea or high likelihood of magic smoke escaping the LEDs? 1) You can drive an LED with much less than its Vf by this method. If the spec says the Vf=3.2 volts and you use 2.8 volts, it will probably work. However, what have you gained? You must use an added capacitor (not very cheap) and it is still an iffy approach. 2) Use the method to make a constant current source. LEDs need to be driven by a controlled current source as opposed to a voltage source. To make a current source (technically a current sink), use an N-channel FET as a voltage controlled resistor. Put a small resistor between the source and ground and measure the current by means of the voltage across that resistor. The LED goes between Vcc and the FET’s drain. Set your analog voltage to the FET’s gate to a nominal value (such as 1.0 volts) and measure your current flowing through the resistor. Increase your analog voltage driving the FET’s gate until you get the current you want. You need to test and adjust your current constantly. This method is a fair bit crude, but it will work. A better approach is a strictly analog one such as using a bipolar’s constant VBE to provide the needed feedback or else an comparator. Obviously, this approach is overkill for low current LEDs, but is a legitimate way to drive high current ones. It sounds like you just need to use the analogRead & analogWrite functions as well as processing the data. Read your data from your scale using analogRead(), and then power your motor with an N-channel FET, giving the PWM to its gate with analogWrite(). For small FETs, you can drive their gates directly or with a small series resistor. For larger ones, you may have to use a driver circuit. First off, thanks very much for the great article! If you’ve got a spare moment, would you mind pointing me in the right direction? I believe I simply need a 0-5v signal to control the power of the light through the dimmer, but of course I could be way off! Just use the example given. Prototype it and measure the voltage output with a voltmeter. It should correspond to your PWM duty cycle. Provided the dimmer circuit you cited takes 0 to 5 volts, you should be good to go. Wow, I love what your doing and how much your helping others. I often search for information for myself and very rarely share solutions. I’m glad someone out there does. Very inspiring. this could be exactly what i’m looking for. i want to take a pwm signal from my computer’s motherboard and drive an analogue dial gauge. what components would i need for this? If your dial gauge measures up to 5 volts, just the resistor and capacitor given should work fine. If your gauge requires a higher voltage, you will need to drive the gate/base of a transistor hooked up to a voltage source matching the gauge, and then filter that PWM signal as before. Hi Scott, thanks for all these great thoughts, its fun reading through this thread! I have to drive a Photomultiplier (PMT) control circuitry with a 0-5V DC control voltage (CV) to generate the respective high voltage (HV) that regulates the PMT’s sensitivity. any ripples are scaled up by a factor of 250 as well which could cause some additional noise on the PMT output due to sensitivity fluctuations. As the Arduino’s PWM output is 5V (UNO in my case), I thought of a 2 pole active low pass filter with an OpAmp (e.g. a LM358 at 14Vcc) to get the full 5V back after the low pass. Do you think that this will produce a DC stable enough or can you think of a better circuitry to be driven from a PWM pin for my purpose? You may have to do some testing to see what is acceptable. Multiple-pole, low-ripple filtering is a good bet. An alternative would be to use an R2R resistor ladder. It would take a lot of pins, but you would have no ripple. That’s the best I can come up with. Have fun. I´ve been working in DAC to drive a directional proporcional valve (0 -10V), but I´ve got de DAC (PWM to Analog) with a AOP LM741. will I need another step to drive the coil of the valve? An op-amp should drive a small coil, but don’t forget to add the bypass diode to protect against the inductive transients. You’ll need to use an op-amp configured as a non-inverting amp with a gain of 2 and supply it with 10 volts (assuming rail to rail op-amp), to give you the required 10 volt peak-peak voltage swing. Then use another op-amp configured as a voltage-follower with a 5v input to create a ‘virtual ground circuit’ (google it for details). Use the output of this op-amp for your ground and the first op-amp for your signal. I’m sorry, I didn’t read all the comments. If my question has been asked before, please point me to the answer and I’ll be grateful. I want to convert: PWM to Analog 0-5Vdc. A very late comment but just getting into this stuff and came across your excellent article. I am driving a PC fan through an H bridge motor controller. I send a PWM signal from the arduino, and can vary the motor speed. Problem is that I get an annoying hum, which only occurs with PWM. If I use a lower voltage (non PWM) on the fan I don’t have a problem. So I imagine that I should use a low pass filter to change PWM into something more like straight DC. I used the calculator to size R and C values, but find that there doesn’t seem to be enough voltage left after the resistor to drive the fan, is the fan barely runs (low speed). Perhaps I have misunderstood but I would assume that the resistor in the filter will cause a volt drop as current passes through it? I’m a complete beginner at this so any suggestion welcome. The problem you are seeing is the fact that the motor is putting a load on the filter. Such a filter needs to have a buffer between it and a load. Yes, the resistor is a huge voltage drop at all but the smallest currents, and the capacitor can store only the smallest amount of charge. Any kind of load at all with cause the filter to not function properly. What you need is an amplifier with high input impedance and low output impedance. Either an op-amp or a MOSFET will serve this purpose nicely. Both have high input impedance (they won’t load the filter at all), and they both have low output impedance (they can drive a large load without bogging down). In the case of using a N-channel FET, put your load between your supply and the FET. Your duty cycle will not be follow a linear relationship to motor speed however. If you want such a relationship, insert a small current sense resistor and feed the voltage across it back into your Arduino and scale your PWM to produce the current level desired. For a choice of FET, this one in a TO-220 package will handle a couple of amps. If it gets too hot, just add a small heat sink. but no one did so it may be a bad question, but could clear this up for me. in your schematic of the filter what connects to the other end of the capacitor? the schematic shows nodes with no further indication of what they are connected to. my assumption is common ground or nothing as dc cant pass through the capacitor. thanks. ill be messing around with this circut to fade in and out a large LED array with my arduino. Yes – the lower wire with its connections is the common ground for both input and output. I apologize that the drawing is not more clear on that. I would like your advice because i am a little bit confused. I have a project in which i have to dim a 10V lamp according to a digital value. I just ordered the arduino starter kit. I have an LPC2468 board but seems to be too compicated for that and the community is not that big. I started to read some things and it seems easy to dim an LED. But how can I produce voltage from an Arduino board? Is there an easy way? My project is supposed to read a value (luminance) from a file and dim the lights accordingly. In addition arduino produces PWM equal to 5 V. is there a way to amplify it to 10V? Its been a long time since the last time that i read about electronics, so plz make it as easy as you can..!!! First: Thank you for the well written article. supplying and analog reference voltage to the Arduino’s “AREF” pin. This would allow the user to adjust the reference voltage through software to meet the needs of the signal that they were intending to read (temperature sensors come to mind). There is already a 32K Ohn resistor on the Ref Pin but that would be on the wrong side of the capacitor. Is there a convenient way to modify the calculation to take this into account? Since the input impedance to the AREF pin is probably quite high, you don’t have to worry about the effects of an additional resistor. I am not sure this is the best way to go about what you want to do though. Using a precision 2.5v reference IC is what I would suggest. It would be very accurate and independent of supply voltage. great article . Dear i have a question . now i got a mic+amp+pot i want to feed it into arduino and get an output digitally and send it via a TRx RFM22 . do i need a buffer for it ? second thing , what if i use my mic+amp+pot as input , then the output i want to hear it via speaker . should i still use a buffer ? …. Do i need to divide 1023 from ADC by 4 so it can be heard properly in the output ? because i know the ADC reads from 0 to 1023 and the PWM from 0 to 255 . wouldnt there be loss in data ? I’m doing PWM to analog voltage conversion in my project. We are using second order RC low filter to convert from digital to converter. It would be helpful if you share the calculation to find out value of the step response and peak to peak ripple voltage and settling time. 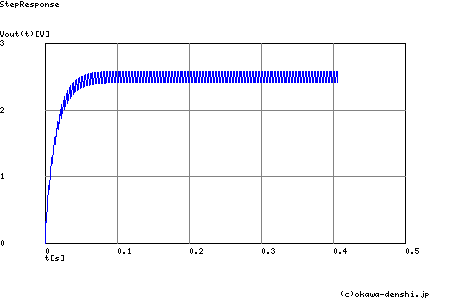 and how to make the relation between pwm input signal and rc filter in equation to get the output waveform. Adequate and well explained, got me up to speed quickly. Thanks for your effort. I’m just getting into this Arduino stuff and loving it. Salutations! How can I type numbers from 0-255 from seiral USB keyboard to control PWM and analog output? Hi this article is fantastic!! And one question I would like to understand. How to convert PWM -> RC filter to +- voltage. ex. Here I have a PWM channel where the voltage level is 5volt. so if I use your suggestion, only 5 volt is available for filtered ouput. So how can I get negative 5 volt by using the similar manner? Many thanks for your kindly help. i wonder if our group is using the correct value for resistor and capacitor for the low pass filter. 10k ohm and 3.2 nF respectively for a 5khz cut-off frequency. this application is for our project wireless communication based laser with certain distance to cover.. we are using a PIC 877A for a PWM output, then we decided to low pass filter the PWM output to generate analog waveform. does it make sense sir? and one thing also i have read some forums online is that in order to acquire the right value for resistor we have to refer first on what input impedance we have in our audio amplifier, say if input impedance is 10k ohm then the resistor will also then be 10k ohm..BUT as far as what i have searched, typical input impedance say for LM386 is 50k ohm. seemed to be too large. what could be the right thing for this sir?. alternatively, we planed to use IC 555 timer to generate PWM and wire up the low pass filter for analog output. i wonder if what could be other consideration for this?. or say is this possible and applicable for our project?. hi, i find your project when i was searching for an audio to pwm transformation. i m trying to drive some pomps to create an equalizer graphic with water. i understand that what i want is kind of opposite of what you did here but i m wondering if you can do this, can the oposite be done? what i mean is can we input an audio signal and convert it into a pwm signal? if yes can you help me to understand the prosses. and i m sorry for my bad english. Thank you Scott. I believe you have described what I am needing which is a method for an Arduino to mimic the controller for a submersible Speed Wave DC aquarium pump. I think these pumps must have their own PWM controls potted into the pump. The external controller provides a steady 24 volt source to the pump and a 0 to 4.9 volt control signal for on/off and 6 speed levels. I have assumed at this point this 0 to 4.9 control signal is not PWM from the controller to the pump. My questions are: One, why would I care about cutoff frequency? I think I need to pay attention to the ripple and how long it takes to go from one voltage to another. Second, the OKWA calculator looks at 0% to X% as duty step. How can I figure the time going from X% to Y%? I assume this is the ramp time going from one speed to the next for the pump application. Thanks again. My question is: Would I be able to control sound volume (from an external source) through a transistor with this analog output? If not, do you have any suggestions? In my project space is verry limited so as few components as possible would be nice. I’m curious of a DAC like this would work for driving galvanometers, which don’t like raw PWM input (At all…), for a UNO-programmable laser light show. Assuming it would, any idea what changes might need to be made? Sorry if this is a noob question, I’m kinda new to both Arduino’s and Galvos. Hello Sir. I need an analog control signal ranging grom -5V to +5V. Can I use this approach to get 0 to 5V, and then use an amplifier with gain 2 to get 0 to 10V, and clamp it negative by 5V to obtain -5V to +5V? I have PWM out put from a Radio Control Receiver that i need to connect to an RS485 input to control the zoom on a camera any pointers you have would be much appreciated as i have no idea how to do it. by using this code i have calibrated 2 ESCs (esc1 and esc2) out of 4 and they are working fine. but other 2 ESCs(esc 3 and esc4) are not calibrating properly although the ESC is giving the calibration confirmation tone but motors are not rotating. Trying to eliminate the noise from a Micro when Pulse With Modulating “PWM” the Analog out with LED’s attached! The LED’s are mounted inside of an electric guitar and the pickups of the guitar are amplifying the sound of the Arduino Micro. I’ve tried to change the Timers 0,1,&2 frequency but unfortunately I was getting an error when trying to change the frequency of Timer #2. Are there only 2 timers on the Micro being #0 & 1? what is the easiest way to control the PWM pulse width? Hi Scott, thanks for all these great thoughts. I am a beginner in Electronics. I have designed a switch mode power supper made up of a MOSFET to driver a high current LED (1.2A). My switching frequency is about 1.5Mhz. I have also built an analogue PWM consisting of op amps for switching the Mosfet. What is the easiest way to control the PWM pulse width? is it possible to use a common controller (P, PI, PID) to change the pulse width? if yes how? I will be grateful to get some hints. This article was very unique and informative.Incredible unique article like this will be helpful for many like me in finding the best Load cell supplier in India. This is interesting. I am trying to produce a greenhouse controller – using a Nano. Outputs are limited but I am thinking along the lines of a digital demux. I guess using a PWM converter driving a bargraph display driver like the LM3914 would be worth looking at. The LM3914 drives 10 LEDS but it might be possible to drive some of the relays on the relay board currently available. Would I have to use some sort of buffer between the Converter and the LM3914? kindly tell me that will these output voltages be varying or not?? means will it be vary from 0 to 5V dc volts after converting arduino PWM?? Great Tutorial, I was looking for exactly that. This explains some similar cirtuits I am seeing on power supplies starting from an opto-coupler. So my question is do we have any inbuilt library in arduino through which we can somewhat achieve a voltage of such variable pattern ? Also I don’t want to change it manually by using adjustable voltage regulator. My requirement is when i run the code, the voltage changes occur automatically after every 5 seconds. I’m trying to run a .28 volt meter from 4.5 to 8.4v from the output of a Texas instruments se555 timer. What would I need to use as far as parts and their values to get this working? Thanks in advance. Hi! This article is nice and interesting. I got here looking for a method to convert PWM to DC, but I´m trying to control the output Voltage by changing the PWM duty cycle. Will an RC filter work well in this scenario? By working well I mean that changing the PWM duty cycle will proportionally change the output Voltage, keeping the frequency constant. If not, what would be a better approach? I find that .1uF ceramic cap and 3.9k resistor works well for everything that I have tried. BUT… I also use a filter cap on the output. So this increases the part count buy 1 extra electrolytic cap. I adjust the filter cap to reduce ripple. If driving a transistor, I use a 10uF and go up from there depending on need. Just keep your expectations in check, a person shouldn’t be driving a heavy load from a PWM signal… Be aware that a 100uF filter cap on the output will slow the response quite a bit and even 10uF is a tad bit overkill for just driving a transistor, as there is no ripple at all and response time could be lowered by going lower than 10uF. 10uF is easy to get your hands on though and it seems to be a good enough balance between no ripple and decent response time for my needs. What characteristics n-mosfet should I be looking for to drive a 12v load after the filter? PWM is the best technique with low noise by its easily identifying technique. so the maximum output voltage only 5V? Great article, wonder if anyone can help with this, I am looking to convert a pulse signal 600 pulses per second and to a dc voltage to control a proportional valve on a hydraulic circuit, what I need to achieve is to maintain a constant 600 pulses per second. Basically this is to maintain a constant speed/flow rate to drive a hydraulic motor which in turn drives an AC alternator at a constant 50hz irrespective of fluctuating loads, oil temperature etc. I am really pleased to glance at this web site posts which consists of tons of helpful information, thanks for providing these kinds of data. Hi, i am trying to use a HC SR-04 sonar module with apm 2.6 for altitude control in indoor environments. The sonar module outputs a pulse of width proportional to the distance. But the apm needs analog voltage. So I am trying to read the pulse using arduino’s pulsein function and the write the same mapped to 0-255 using analogwrite to a pwm pin. Then using the filter you mentioned in your post i am trying to convert it to a analog value. When I am reading that analog value using another arduino I find that the values are oscillating between a high value and a low value. I cant find a reason behind this or any possible solution. Any ideas? Hi, i wonder if you can help me? I want to make an analog volume control. I’ve got an Arduino UNO WIFI and a Rotary Encoder. I have so far made the rotary encoder control the output of one of the ~PWM pins. This post explains how i can change the signal to analog. but now I need to know what components i need and how to connect, so i can alter audio volume in analog. My first attempt was just a whiney PWM sounding mess overlaid on top of the audio…. I realise i can just use a potentiometer and no arduino for this. but i intend to add waireless control via an app to alter the volume as well. I just need to know how can I calculate for PWM to DC 0-12V components? Input voltage can be 12V or 24V! writing this post and the rest of the website is also reall good. your blog and look forward to all your posts! Carrry on the superb work! that you just shared this helpful info with us. Please keep us up Software To Manage Crossfit Gym date like this. nonetheless, you command get bought an nervousness ver that you wish be delivering the following. I am getting know-how all the time by reading thes pleasant articles.